We performed a web search for books on Vedic Mathematics (last updated April-May 2016). The results of this can be found below and in the links in the menu on the left. N.B. please note that we have not physically seen a large number of the books found in this web search, so we cannot comment on the quality of the books listed here. It should be noted that a large amount of the material is a re-working of the material found in Tithaji's original book. So when deciding on whether to purchase a particular book, you need to consider whether the author has reworded the material in a way that helps with its comprehension or has added a large number exercises to help with practicing the material presented. It should be noted that the recommended page contains books that we believe have added something to the presentation or content of the original material. Author Mrs Rajeshwari Sharma, 2004. This book is a compilation from "Vedic Mathematics" by Sri Bharati Krishna Thirthaji Maharaj. This has been simplified in order to help school children shed their fear of maths and recreate a fascination for the Magic of Numbers in their young minds. Author T. S. Bhanu Murthy, 1992. The purpose of this book is to draw the attention of students and teachers of mathematics to the historical continuity of Indian Mathematics. Starting from the Sulba Sutras of the Vedas up to the 17th century. The book includes proofs, not presented so far, of the propositions started in the well known treatise Vedic Mathematics by Sri Bharati Krishna Teertha. It also introduces to the modern reader the work of Aryabhata, Brahmagupta Bhaskara and Madhava. A PEEP INTO VEDIC MATHEMATICS. Author: B R Baliga, 1979. This book presents the method of fast calculations. This magical tool is based on ancient Indian principles and is unique in its field and help enhance your calculating speed without having to resort to the abacus or electronic computing machines..
‘Vedic Mathematics’ is a magical, method of fast calculations. This magic tool is based on ancient Indian principles. It is unique in it’s field, and helps enhance the calculating speed of students, without having to resort to the abacus or electronic computing machines. This book will give you the cutting edge in crucial examinations that can help you steer your career towards the pinnacle of success. The Principles of Vedic Mathematics. Vedic Mathematics: The Ancient Indian Knowledge. Originating from an unparalleled confluence of religion and science, Vedic mathematics is a unique approach to understanding and solving mathematical problems. It has for long been used in solving both basic, as well as, advanced level arithmetic. This book introduces the readers to the complete precepts of Vedic mathematics in a simplified and easy-to-learn manner. Beginning with an introduction to its origin and brief history, the book goes on to present the sixteen founding principles of Vedic mathematics. First, It covers basic mathematical processes including addition, subtraction, multiplication, and division. It also takes up frequently used concepts of Highest Common Factor (HCF), divisibility, factorization, decimals, squares, cubes, and roots. The book goes on to explore various types of equations that form part of most mathematical calculations. It covers simple equations, quadratic equations, biquadratic equations, and simultaneous equations among others. More advanced topics like differential calculus, partial fractions, and integration by partial fractions have also been explained using the principles of Vedic Mathematics. The present work Ganitacintamani gives a logical insight to the understanding of 0 and 1 in philosophical, co-mathematical and perspective language, hence, considered as an epoch-making work in the field of Mathematics which will re-visit, rectify and revolutionize Mathematics and thereby all branches of sciences. One would benefit in understanding the intricate concepts by personally visiting Sri Govardhan Peetham. How To Become A Human Calculator? : With The Magic Of Vedic Maths is a book that helps its readers effectively master mathematical calculations. How To Become A Human Calculator? With The Magic Of Vedic Maths provides a step-by-step approach to master concepts of mathematical calculation and problem solving. The book is aimed at everyone, including students, teachers, professionals, and aspirants of competitive exams like GRE, GMAT, MBA, and UPSC. In How To Become A Human Calculator? With The Magic Of Vedic Maths, Aditi Singhal, considered a mathematical genius herself, explains several concepts in simple, easy-to-understand terms. The book contains over 500 solved examples to demonstrate these concepts. The book first introduces two basic concepts of Vedic mathematics. This is followed by other topics like magic with the number eleven, interesting squares, cube roots at a glance, magic division, and a calendar for 500 years. The book also discusses the ways in which Vedic mathematics can be applied successfully in competitive exams. Tabular presentation and color codes are used to highlight important points in the book. Every technique is followed by general guidelines to implement the same. Plenty of exercises accompany every topic, letting the reader practise problem solving and thereby master the concept. Several test papers and corresponding answers have been provided at the end of the book. Proceedings of the National workshop on Vedic Mathematics 25-28 March 1988 at the University of Rajasthan, Jaipur. N.B. it may actually be best to perform an internet search to find a seller of this book, rather than use Amazon, as they do not seem to have new copies available. The book includes mainly the Arithmetic and Algebraic operations, along with Geometry (Pythagoras theorem) and Magic Squares. Though some of the topic/chapter names are in Sanskrit based on vedic formulae and suits the Indian Readers, the contents of any of the topics/chapters is definitely attractive, elaborate with step by step details to all and will not pose any difficulty in understanding the particular operation. The Arithmetic operations include addition, subtraction, multiplication, division, squares and square roots, cubes and cube roots, reciprocal, divisibility etc. The Algebraic operations include multiplication, division, factorisation, solving equations, squares and square roots of algebraic expressions etc. In a nutshell, this book gives important arithmetic and algebraic operations. The author’s first book ‘Speed Mathematics Using the Vedic System’ has gained a significant following. This sequel ’Mathematics Tricks using the Vedic System’ has more tricks that will prove useful for middle, high School(grades 10 & 11) and college students. Factorising/factoring, indices/exponents, simultaneous equations,quadratic equations and trigonometry. The same set of students will find duplex methods of squaring 2 & 3-digit numbers, expanding algebraic expressions,finding square roots,cube roots and solving problems involving repetitive percentage change also useful. In addition some topics in statistics are included. Several mnemonics are also included to help the younger student remember pi, basic trig as well as understand the differences between mean, median, mode and range. Hopefully, teachers will see the value of these techniques in order to motivate their students. 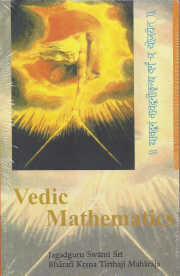 This is a popular book giving a brief outline of some of the Vedic Mathematics methods. It offers easier & quicker methods of multiplication and division than the conventional [Western] ones", the full system only rediscovered relatively recently. Simplifications made easy with "VEDIC MATHEMATICS"
We come across many numerical problems in our daily life and especially in competitive examinations. We would be unable to solve all these perfectly within a while. Forsake of the same, we need some extra-ordinary techniques, we find them in this book. The objective of this book is to unleash the latent potential of your mind and help you to make yourself as a quick human calculator in every sphere of life. I (author and publisher) believe, this book teaches you to solve problems within a while, and develops the inherent intelligence potential. The methods involved in this book enhance problem solving activities. Efforts have been made to provide information about improving fastness in basic simplification of mathematics in this small book. Readers are required giver their opinions if any. Publisher-Shreyas publications. Date Nov 1989. This book covers nearly 13 Sutras, from Nikhilam -Vilokanam dealt in 23 chapters. For the age group of 10-18. Very useful for class room teaching and self learning. Some examples have also the comparison with current strategies . Speed Mathematics using the Vedic system makes learning basic mathematics more rewarding. The average pupil will be able to work out calculations such as 46X44, 95X95 and 116X114 mentally, often faster than a calculator. Pupils will understand how to work out squares,cubes, percentages,fractions,and equations with ease. Paper and pencil will still be required for most questions, but the speed and accuracy of calculations will improve significantly. This in turn motivates pupils to learn more. This book provides smart strategies for mastering basic Number work and Algebra. These two areas are the building blocks in mathematics. Once pupils can master these aspects they will feel confident to tackle other branches of mathematics. This book is suitable for children from 10 to 14 years of age, but adults who have found mathematics difficult in the past will also benefit from it. This is a work book on mathematics using ancient vedic sutras. It is explained in simple language how by using the sutras complex problems can be solved easily and quickly. Why is Vedic mathematics Essential? Meaning of Vedic Sutras and their applications. Tiryak, their meanings and applications. polynomials havin an unequal number of terms. method - their meaning and applications. Duplex Vedic Method of finding square root. Calculus in extrating square root. sutra - Vilokanam, its meaning and application. multiplication, division, square and cube. and Difference of Compound Angles etc. The Essentials of Vedic Mathematics. A handy and useful guide to mastering Vedic mathematics without any help from experts. Vedic mathematics is an ancient technique consisting of sixteen sutras and sixteen sub-sutras. It simplifies not only the fundamental arithmetic operations, such as multiplication and division, but also more advanced concepts such as simultaneous equations, quadratic equations, the factorization of cubic equations, and so on. This mathematical technique is rapidly emerging as a tool for students appearing in various competitive examinations, including CAT, MAT, XAT, SAT, engineering and banking examinations, where speed and accuracy play a vital role. As a bonus for students, Rajesh Kumar Thakur has also included in this book chapters for CBSE and ICSE board examinations. Written in simple and lucid language, The Essentials of Vedic Mathematics has been designed to benefit the maximum number of readers. Now you can comprehend the basics of Vedic mathematics without any help from experts. This book contains 156 photocopied pages, is computer-typed, highly illustrated, the book is a golden rectangle but fitted or orientated to A4 landscape , and wire bound. Originally known as "The Magic Of Nine In Vedic Mathematics" it goes beyond the Vedas, and belongs to Universal Knowledge. This is Jain's lifetime collection of interesting information regarding the mystical number 9, enhancing the student's love for numbers. A superior system of Vedic Mathematics that will enhance the current western curriculum in schools. You will never again multiply or divide the way you do now after understanding the 16 basic sutras. This book includes various multiplication methods and checking with digit sums, division, squaring and square root, cubing and cube root, recurring decimals, divisibility testing and simultaneous equations. It also has a chapter at the end on applications of Vedic maths . Published by Mathematical Sciences Trust Society. Please be aware that this book takes a critical stance against the claims made for Vedic Mathematics and does not attempt to teach any Vedic Mathematics. It is included here for completeness. Speed multiplication of single digit, double digit and triple digit numbers using vedic math principles. This book contains 152 photocopied pages, is hand-written, highly illustrated, the book is a golden rectangle but fitted or orientated to A4 landscape , and wire bound. "The Vedic Mathematics Curriculum For The Global School" but the title no longer applies as "Jain Mathemagics" is wider in its spectrum and more highly visual than the limitation of just analytical "Vedic Mathematics". eg: if a computer has too much data and it needs to be stored economically or sent efficiently, it can be solved by digital compression. With colorful Flow Chart and Diagrams working out the Sutras. Children of 8-10 years enjoy this work book with plenty of Problems to work out. With 9 chapters. This Book presents techniques taken from ancient Vedic system that help to do calculations much faster than most of the well known techniques that we learn in high-school. According to the author, the book is helpful for students in school as well as for those planning to appear in competitive exams such as SAT, GMAT, CAT, NTSE, Olympiad and other competitive examinations, as the described techniques develop creativity and math skills. In addition, a variety of problems are solved in the book using the Vedic math techniques just to demonstrate the usefulness of this ancient art. Vedic Mathematics is much more than a magical method of fast calculation. While mastery of its simple sutras-and a little practice-undoubtedly enables one to perform mental computations with lightning speed, what is really fascinating about the subject is that it springs from what are normally considered religious treatises! But ours is a mechanistic universe governed by immutable mathematical laws, where everything functions according to definite principles. Be that as it may, Vedic Maths-based on hidden rhythms and patterns bequeathed to us from hoary antiquity-will prove to be an invaluable aid for every modern human who has to cope with numbers, whether a school kid, a student preparing for a major competitive examination, an engineer, a beleaguered housewife, or a counter salesman... a magic wand to ease the pressure of 21st century living. Vedic Maths is much more than a magical method of fast calculation. While mastery of its simple sutras and a little practice, undoubtedly enables one to perform mental computations with lightening speed. Vedic Mathematics is not only a sophisticated pedagogic and research tool but also an introduction to an ancient civilisation. It takes us back to many millennia of India’s Mathematical heritage. Rooted in the ancient Vedic sources which heralded the dawn of human history and illumined by their erudite exegesis, India’s intellectual, scientific and aesthetic vitality blossomed and triumphed not in only in philosophy, physics, Astronomy, ecology and performing arts but also in Geometry, Algebra and arithmetic. Vedic Mathematics is just around 50 years old and has lot of potential and wealth in it. With more and more excavation in this subject, quiet a lot of complicated calculations/ applications can be made simple and easy. Normally it is seen in any standard text book on Vedic Mathematics different types of problems are considered and solutions provided using one or more of the formulae or corollaries. However, each of the formulae/ corollary has been individually explained with example(s). This makes this book a unique of its kind. Let the readers get benefitted by the treasure of Vedic Mathematics. This book appears to have been reprinted under different titles. Vedic Mathematics is a magical method of fast calculations. This wonderful tool has been developed on the basis of ancient Indian principles. This unique method of calculation is a book for students. It helps them to increase their speed of working with figures, independently of electronic computing machines. This book will give you the cutting edge in crucial competitive examinations, and help you steer your career towards the pinnacle of success. Vedic Mathematics uses Vedic Sutras to make difficult calculations and equations easy to handle. This book is considered to be the ultimate work in Vedic Mathematics, and provides an introduction to this subject. The book Vedic Mathematics talks about an ancient system of calculations that is derived from the Vedas. It was rediscovered in the early part of the twentieth century by Sri Bharati Krishna Tirthaji, who spent a lifetime studying the various Vedic Sutras and traditions. The Vedas have been handed down through the generations in an oral tradition, and not all the concepts have been written down and documented. Introduction, Vedic Sutras for Addition – Ekadhikena Purvena and Sunyanta, Its Meaning and Applications. Introduction, Vedic Sutra for Subtraction – Ekadhikena Purvena and Param Mitra, Ekanyuena Purvena and Param Mitra, Its Meaning and Applications, Digit Separator Method for Subtraction. Introduction, Vedic Sutras – Nikhilam Navatascaramam Dasatah, Anurupyena, Ekanyuena Purvena and Urdhva-Tiryak, their Meaning and Applications, Dot and Stick Method of Multiplication, Multiplication of three numbers etc., Multiplication using Napier’s Rods. Introduction, Vedic Sutra – Nikhilam, Paravartya Yojayet and Dhwajanka, Their Meaning and Applications. Introduction, Checking the accuracy of Addition, Subtraction, Multiplication and Division. Introduction, An Interesting Pattern, Relation between Triangular Number and Square Number, Vedic Method for Squaring – Ekadhikena Purvena, Anurupyena, Yavadunam and Duplex Method, Its Meaning and Applications. Introduction, Important Points to Remember, Aryabhatta’s Method to find the Square Root, Fundamental Rules to Extract the Square Root of a Number, Duplex Vedic Method for finding Square Root, Square Root of an Irrational Number. Introduction, Properties of Cubic Number, Algebraic Method to find the Cube. Different Vedic Sutras – Anurupyena, Nikhilam, Ekadhikena Purvena and Yavadunam, Its Meaning and Applications. Introduction, Important Points related to Cube Root, Vedic Method of finding Cube Root of any Number less than 7 digits, Vedic Method to Extract the Cube Root of any Number having 7, 8 or 9 digits. Introduction, Different Vedic Sutras – Sunyam Samya Samuccaya, Paravartya Yojyet and Anurupye Sunyamanyat, Its Meaning and Applications. Indispensable to students appearing for Competitive Exams.In recent times, a renewed interest in Vedic Mathematics has grown all over the world, as it offers fast-track calculations in a simple way. With a little practice, one can solve tedious mathematical problems such as square roots, cube roots, multiplications and divisions etc. mentally in no time. A special method – Casting out Nines – counter checks all fundamental mathematical operations with ease. Rajesh Kumar Thakur, a postgraduate in Maths, Operation Research and Education, has been teaching secondary and senior secondary school students for the past twelve years. The charm of numbers made him a lover of mathematics. He has been associated with many prestigious public schools in Delhi, Jharkhand and Rajasthan as a guest teacher of mathematics. He has written several books, and hundreds of his essays/articles have been published in many leading magazines and newspapers all over the country. A simplified approach for beginners, can you multiply 231072 by 110649 and get the answer in just a single line? Can you find the cube root of 262144 or 704969 in two seconds? Can you predict the birth date of a person without him telling you? Can you predict how much money a person has without him telling you? Can you check the final answer without solving the question? Or, in a special case, get the final answer without looking at the question? Can you solve squares, square roots, cube roots and other problems mentally? All this and a lot more is possible with the techniques of Vedic Mathematics described in this book. The techniques are useful for students, professionals and businessmen. The techniques of Vedic Mathematics have helped millions of students all over the world get rid of their fear of numbers and improve their scores in quantitative subjects. Primary and secondary school students have found the Vedic mathematics approach very exciting. Those giving competitive exams like MBA, MCA, CET, UPSC, GRE, GMAT etc. have asserted that Vedic Mathematics has helped them crack the entrance tests of these exams. For some reason there are two Amazon Standard identification Numbers ! Vedic Mathematics offers an easy way to solve problems in modern mathematics using 16 Sanskrit Sutras recovered by Swami Bharati Krishna Thirtha. School/College students can easily learn this and practice themselves. It is meant as source book for students and will be very much helpful in competitive examinations. Knowledge of Sanskrit is not necessary. Several indigenous mathematical techniques were used all over the world. Some of them have fallen into oblivion as a result of colonization and modern education. Ancient India had several methods to simplify the learning of mathematics. Vedas are storehouses of ancient knowledge. Vedic mathematics is found in the appendix of one of the four vedas, the Atharva veda. Extensive research on the applicability of these methods is being carried out in several countries. The aim of this book is to make these ancient methods accessible to mathematics lovers all over the world and it will help to make mathematics easy to understand and fun. It is based on sixteen word formulae. Practicing vedic mathematics will help those who have difficulty with conventional mathematics, and will help to reduce the stress of understanding mathematical concepts.